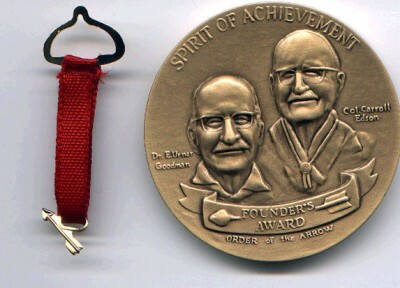 Introduced at the 1981 National Order of the Arrow Conference, the Founder's Award was created to honor and recognize those Arrowmen who have given outstanding service to the lodge. The award is reserved for an Arrowmen who demonstrates to fellow Arrowmen that he or she demonstrates in his or her everyday life the spirit of achievement as described by founder E. Urner Goodman and cofounder Carroll A. Edson. Lodges may petition the national Order of the Arrow Committee to present up to four awards annually, based on lodge membership. If the lodge presents more than one award, one must be to a youth under the age of 21. The Award is a handsome bronze medallion bearing the likenesses of E. Urner Goodman and co-founder Carroll A. Edson, with wooden base and brass plate suitable for engraving. Also available is a special Founder's Award arrow ribbon, with a gold colored arrow suspended from a red ribbon.